One of the recurring questions to Bavarian Otto concerns inoperative odometers on the 1980s vintage BMWs. This would include 3 series 84 thru 91 (E30 – 318i, 318is, 318ic, 325e, 325es, 325i, 325is, 325ic, 325ix, M3), 5 series 82 thru 88 (E28 – 528e, 533i, 535i, 535is, M5), 6 series 83 thru 89 (E24 – 630csi, 633csi, 635csi, L6, M6) and 7 series thru 87 (E23 – 733i, 735i, 745i, L7). These models have an electrically driven, analog speedometer which receives its signal from a speed sensor mounted in the differential. 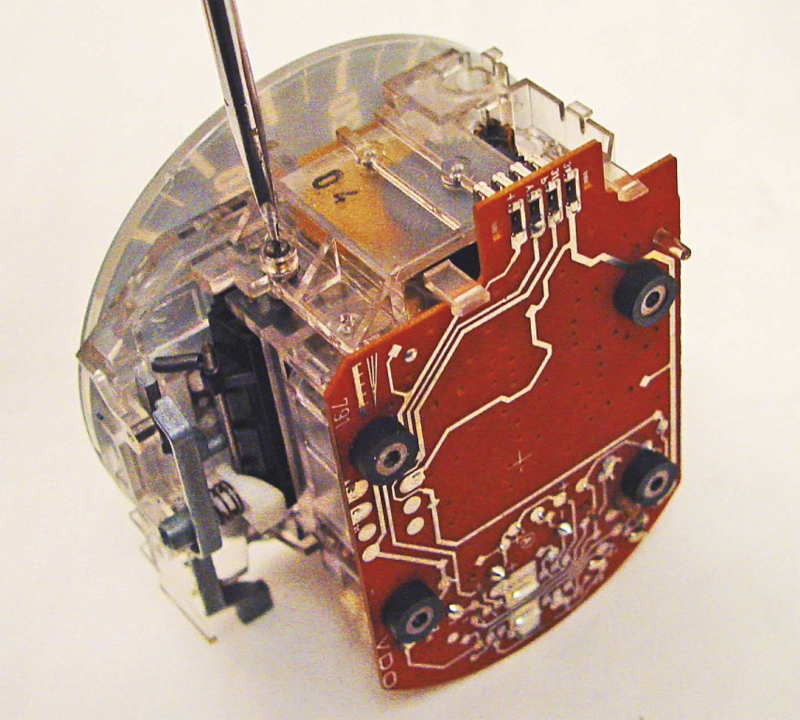 The odometer is driven by a separate, small motor and a set of reduction gears. With age, these small plastic gears can break or strip, which renders the odometer inoperative, even though the speedometer still functions fine. 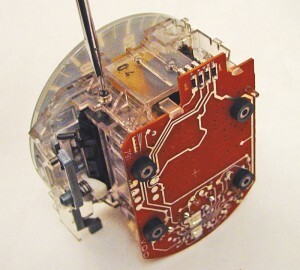 The odometer drive motor can also fail, but we have found that the gears are typically the problem. These odometer drive gears are relatively easy to replace. 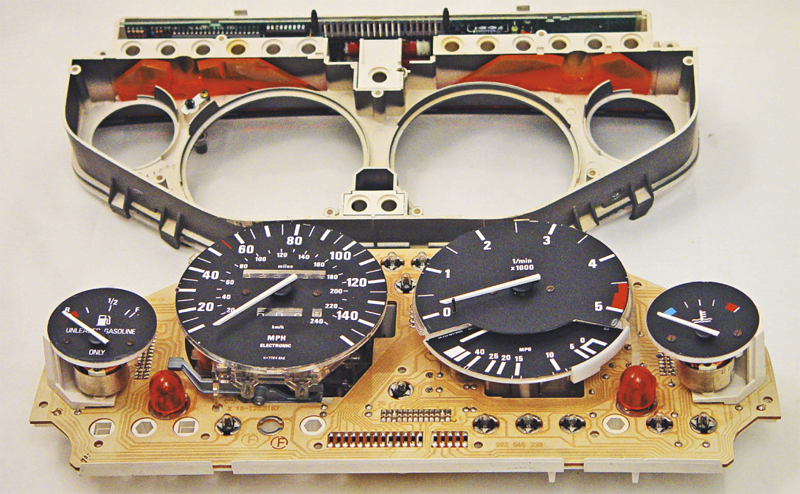 Before starting the job, determine if your instrument cluster was made by VDO or Motometer. 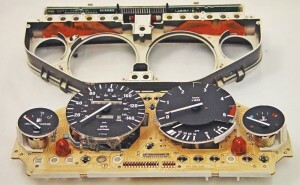 Look in the center of the cluster display, between the tachometer and the speedometer; the name will be molded into the black plastic, or will be printed on the face of the speedometer or the tachometer. Before you order new gears for your inoperative odometer, you must verify that the gears are in-fact the problem (remember there is a chance that the odometer drive motor may be faulty) and determine which gears you have. To do this, the instrument cluster must be removed from the vehicle. This is typically a straightforward operation and, at most, may require the removal of a couple trim panels and the steering wheel. (Refer to the appropriate repair manual for removal procedures for your BMW.) Once the instrument cluster unit is removed, you can easily disassemble the cluster to check whether the gears are bad and, if so, order the ones you need. 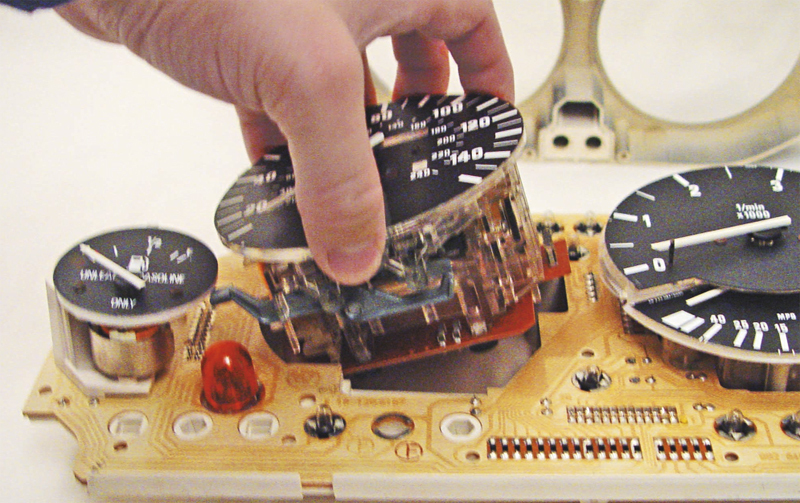 (This would also be a perfect time to replace any indicator or illumination bulbs that may be out, as well as the Service Interval PC Board, if you are in need of one). Just call our agents at 800-535-2002 for additional assistance in ordering illumination bulbs or other related parts. Follow along as we disassemble and check the odometer gears on a VDO cluster from an ‘88 325i. 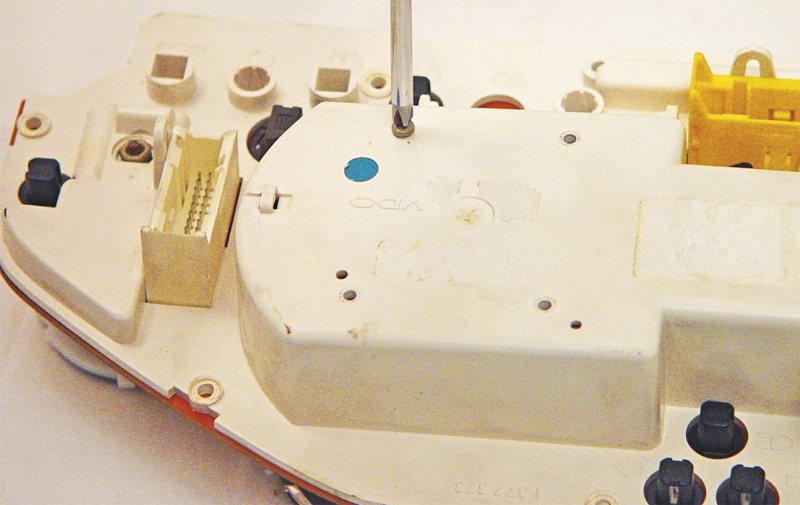 1 Remove the nine Phillips head screws securing the faceplate and bezel to the cluster assembly. 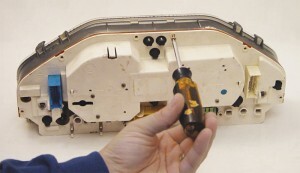 2 Using a flat blade screwdriver, release the two snap tabs at the bottom of the cluster and separate the cluster from the faceplate and bezel. 3 Unclip and remove the green connector plug housing from the back of the cluster. 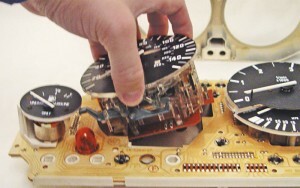 Remove the four Phillips head screws securing the speedometer head assembly to the cluster. 4 Pull the speedometer head from the cluster. 5 Look at the speedometer head and note the clear plastic cover over the odometer drive gears. Remove the four Phillips head screws and pull the cover off. 6 The drive gears can now be removed and inspected. 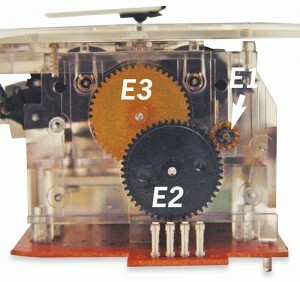 Typically, the E1 gear will be broken or stripped. This can then cause damage to the other gears. See the special notes below on removal of the E1 gear bronze hub. 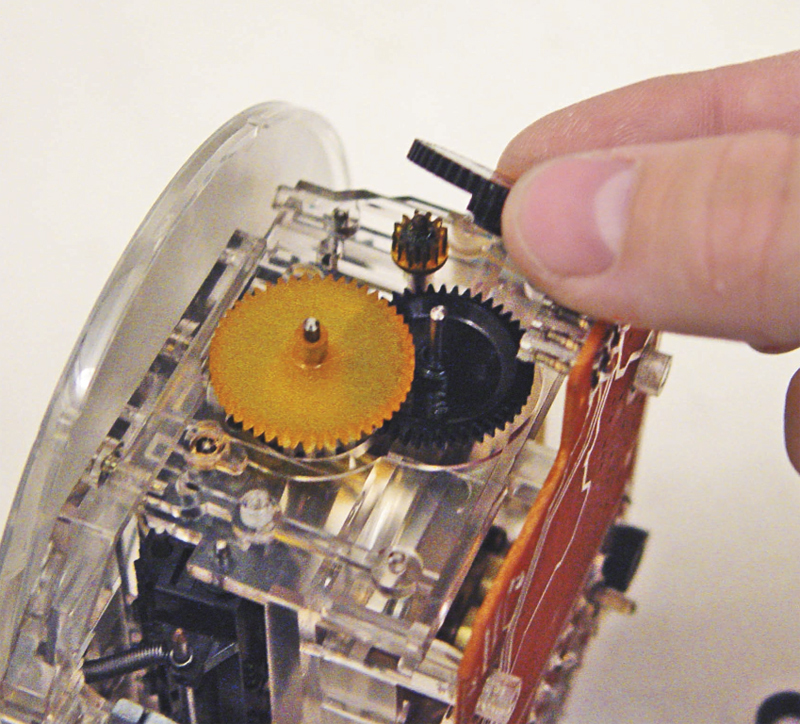 7 On VDO units, you must count the number of teeth on the small side of the “E3″ gear. The E1 and E2 gears have only one option. Motometer units also have just one option for the E1, E2, E3 and E4 gears.